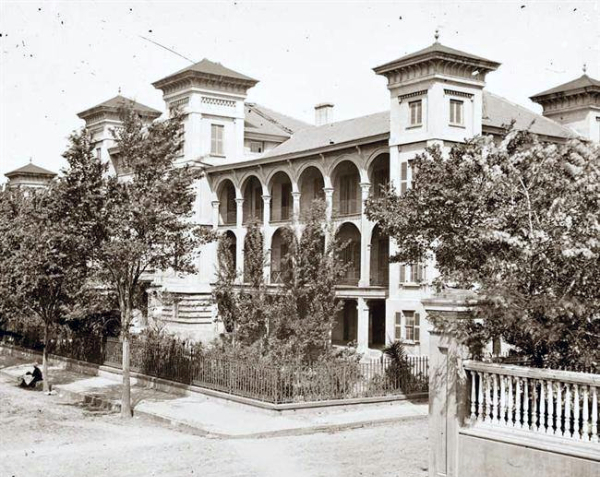 Next week is National Hospital Week, so we thought a look at Charleston’s history in hospitals might be a good topic to explore. When asked about old hospitals here, a lot of people readily remember, for example, the old Baker Sanitarium overlooking Colonial Lake. It had a nearly 70 year run (1912-1981) before the hospital relocated and the building was repurposed as residential units. 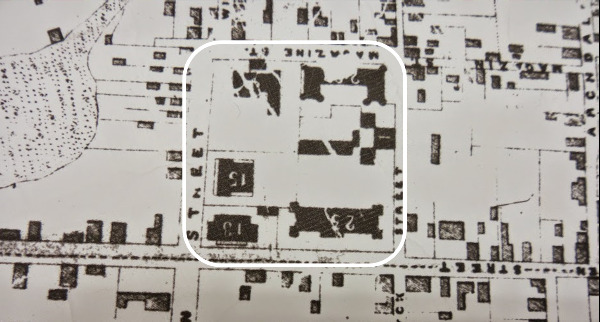 Some may remember the myriad transitions of the medical complex on the north side of Calhoun Street, but we’ll save that story for later. This week, let’s go down the peninsula to the original site of Charleston’s hospital hub. In 1680, a four-acre tract was set aside for use as public land and was used initially as a burying ground. The square was bounded by Magazine, Mazyck (now Logan), Queen, and Back (now Franklin) Streets. A series of powder magazines was built here (hence the street name) in the early 18th century, and subsequently the city constructed (as seen in the 1852 Bridgens and Allen map above, clockwise, from upper left) the Jail, the Work House/City Hospital, the Poor House, Roper Hospital, the Medical College, and the Marine Hospital. Two of these buildings are still standing: the Old Jail and the Old Marine Hospital. 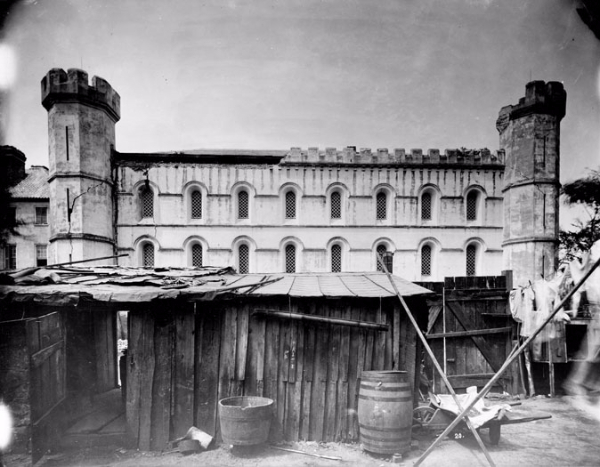 The Jail was built in 1802 and expanded and remodeled several times. 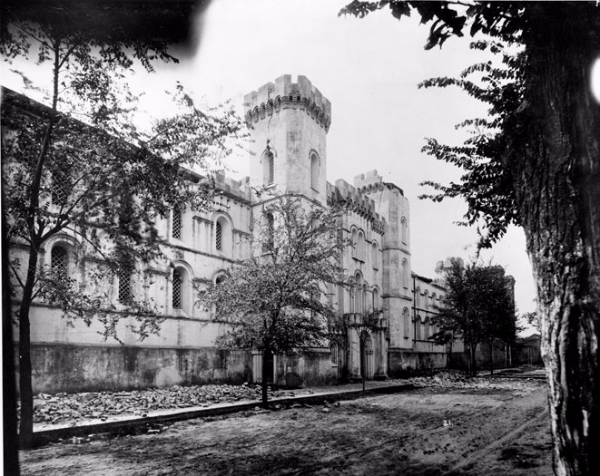 It housed a variety of inmates, including the famous couple John and Lavinia Fisher who were convicted of murdering and robbing travellers on the Charleston Neck; the last of the captured pirates awaiting hanging here; and Federal prisoners-of-war were kept here during the Civil War. The building continued in use as the county jail until 1939, when it was purchased as part of the Robert Mills Manor project. It is currently being used by the American College of the Building Arts until their new facility in the trolley barn at 645 Meeting Street is completed. The Old Marine Hospital (ca 1831) was designed by Robert Mills and is one of only eight remaining from a group of around 30 marine hospitals built before the Civil War. After the Civil War, the Episcopal Church used the building as a free school for black children and from 1895-1939 it housed the Jenkins Orphanage. In 1939, the Housing Authority of Charleston purchased the building as part of the Robert Mills Manor and today it houses its administrative offices. 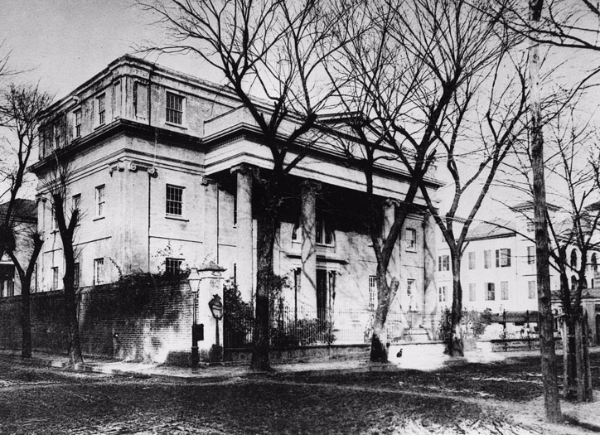 The original site of the Medical College of South Carolina at the corner of Franklin and Queen was built in 1827, three years after the college was founded. By 1832 a rift developed between management and faculty of the Medical College. 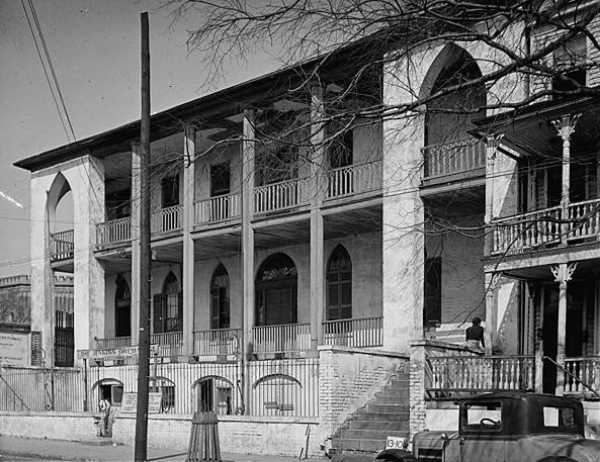 The faculty left and opened a new institution, the Medical College of the State of South Carolina, which opened in the defunct Charleston Theatre (ca. 1793) at the then western end of Broad, at New Street. 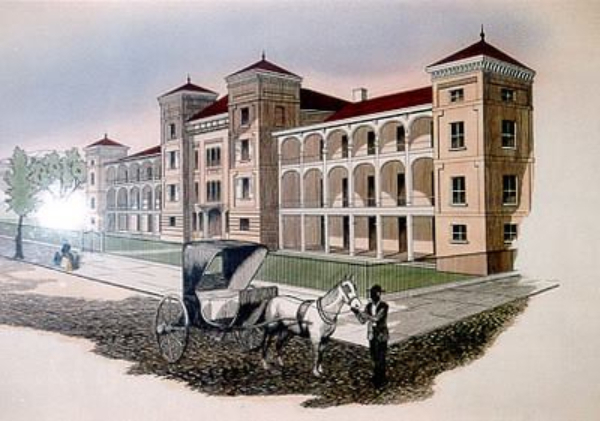 For about six years, the schools were in competition but in 1838 the original medical college closed and transferred its property to the Medical College of the State of South Carolina. Since the former theater was no longer needed for classrooms, it was opened as a teaching hospital in 1840; thus, the old theatre on Broad Street served as the College Hospital for about 15 years before the first Roper was built. It accepted both black and white patients and "those laboring under madness in its various forms" as well as maintaining an obstetrics ward. The original Medical College building was demolished in 1938 to make way for the construction of the Robert Mills Manor. 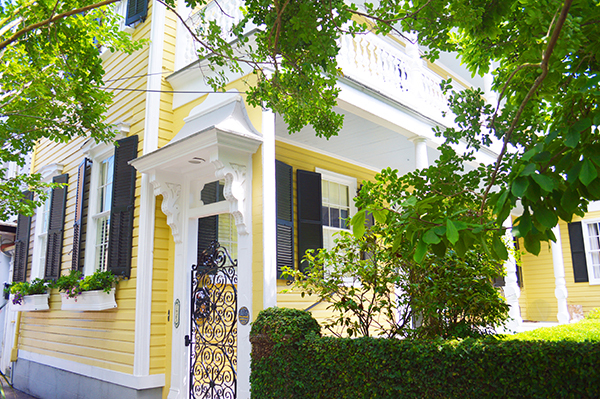 The corner of Magazine and Mazyck (now Logan) Streets housed a Work House for runaway slaves before the Civil War and then served as the City Hospital, which had previously been located in the adjacent Poor House. Most of the patients at the City Hospital actually came from outside Charleston County since there was no state-supported facility for indigent care. The large Gothic Revival building (ca. 1850) was not the best place for a hospital as it was damp and had poor circulation and there were no provisions to isolate patients suffering from communicable diseases and fevers. Its reputation was so poor that Charlestonians actively avoided City Hospital. It’s no wonder! It’s hard to believe that this massive structure used to sit in the middle of downtown, isn’t it? What’s really amazing about this block of buildings is that it--much like the rest of the city--seemed to take a beating and keep on ticking. First, there was the Great Fire of 1861, which created a “Burnt District” across the peninsula that was 250 yards wide and 1800 yards long. Robert E. Lee was staying at the Mills House Hotel on the corner of Meeting and Queen when the fire roared by from its start on the eastern end of Hasell Street. Fourteen houses were blown up on the north side of Queen Street to save the hospitals from destruction, and the plan worked. After burning both corners on the south at Queen and Mazyck (now Logan), the fire turned southwest and raced to the Ashley River. The war commenced; patients and prisoners periodically had to be moved when artillery shells fired by Federal troops from Morris Island fell too close for comfort. But the final blow came after the war with the Earthquake of 1886. The walls of the City Hospital crumbled and its heavy buttresses fell to the ground. A tower at Roper Hospital imploded and part of the front wall fell. Patients from both hospitals were moved to a makeshift facility at the Agricultural Hall on Meeting Street (where the Gibbes Museum of Art now stands). The City Hospital was badly damaged and was demolished after the earthquake. The city built a new facility at the corner of Lucas (now Jonathan Lucas) and Calhoun Streets and Memorial Hospital opened in 1888. The Old Roper Hospital was partially repaired in 1891 and sold in 1892; a new Roper Hospital was built on Calhoun Street in 1904. Tune in next week for the rest of the story of Charleston’s medical history! The flankers on the Old Roper Hospital were torn down following the earthquake, and Marlborough Realty built the Queen Anne style homes on the site in 1913. The central section section of the hospital, however, survived. It was made into the Marlborough Apartments and the residence of the owners of the realty company, whose family lived here until Hurricane Hugo (1989) so severely damaged the structure that it had to be taken down. All that remains of the Old Roper Hospital is the sandstone fence gate around the property and a small plaque noting the significance of the site. Across the street at 133 Queen Street is the ca. 1869 John Henry Bullwinkle House that the successful German merchant rebuilt on the site of his pre-fire establishment. Retaining its storefront, the building has continued in neighborhood grocery use with various owners since its construction. 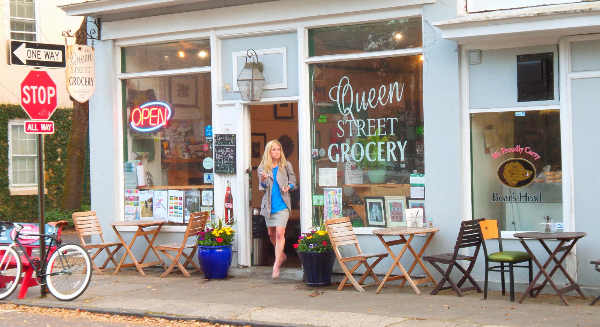 Named Queen Street Grocery for many years, the business continues to thrive and is a favorite of Harleston Village residents. We love to stop in for a crepe! 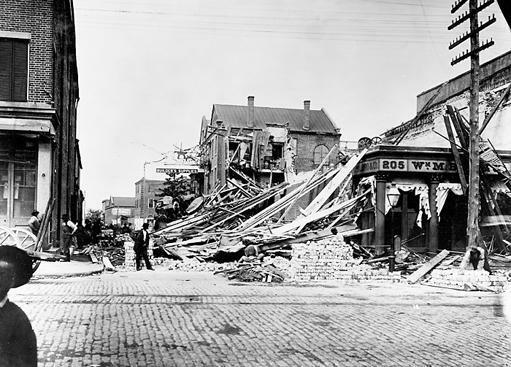 A special thanks to the Charleston County Public Library Archives and "Faults and Fractures: The Medical Response to the Charleston Earthquake of 1886," an online exhibition of the Waring Historical Library, Medical University of South Carolina Library. Charleston, SC: Waring Historical Library, 2011.